Several weeks ago my local Shaws had "Pub Burgers" on sale, and I had to grab them for dinner with the boyfriend (I warned you that I love to cook for him). I froze them until last week, when i had the opportunity to make a meal out of them. I thawed the burgers overnight, then seasoned them with salt, pepper, and a little garlic powder. I seared my burgers in a hot skillet on both sides until they were about medium. 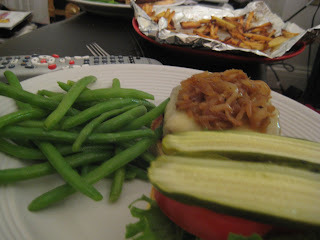 The burgers were smothered with chedder cheese and carmelized onions. I served them on rolls that had been griddled in a separate pan with a little butter. This is actually a picture of the boyfriend's plate because it was far prettier than mine. He loves lettuce, tomato, and pickle atop his burger. I instead, prefer to eat these additions separately....I know, weird. The pickles were his idea and they were top notch. We rounded out the meal with some steamed (organic) green beans, and some oven 'fried' french fries (those are on the plate in the way-back). I sliced some potatoes into thin french fry shapes...drizzled with a little olive oil, salt, pepper, and a little garlic powder and paprika. Bake at 350 for about 30 minutes or until golden and crispy. This meal always goes over well with the BF.